Enjoying a resurgence in popularity thanks to the current trend of DIY crafts, the hand spindle remains one of the most productive, versatile, and convenient tools for creating stunning fiber arts from home, as this beautifully illustrated guide from a veteran spinner and spindle aficionado demonstrates. With step-by-step instructions, this essential manual details the basic steps of spinning and then advances to the more complicated spinning wheel, showing how to use the spindle to make specific types of yarn, explaining traditional spindle spinning techniques, and detailing five simple projects designed to instill confidence in creating a variety of yarns with this simple tool. 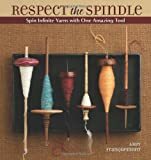 Combining fascinating historical narratives, traditions, and cultures from around the globe with vivid photography, this all-encompassing tour of the spindle also boasts easy-to-follow, contemporary techniques and styles that affirm the tool’s enduring legacy. The ultimate reference for knitters at every level-step-by-step directions and detailed instructional illustrations cover every aspect of knitting know-how. Includes a special “help!” section for the inevitable mishaps, and shows how to correct errors.